Make sure your team has the tools they need by providing 24/7 access to essential resources and training. O’Reilly learning gives your teams the knowledge to achieve more. Leading a team with different levels of experience toward a common goal can be challenging. Make sure everyone on your team has the tools they need for success by providing 24/7 access to essential resources and training with O’Reilly online learning. O’Reilly gives our employees what they need to be successful every day. Gain deep expertise within specific fields of practice. Network with your community of peers and experts. Keynotes feature an insider’s view of the emerging trends that you need to focus on. 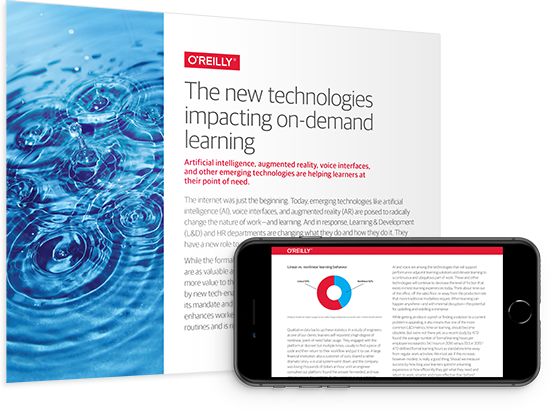 The convergence of new technologies and approaches to learning can lead to enhanced productivity, retention, and motivation. Please tell us who we’re sharing this with and we’ll email you the report.